Sure to be on Regis Philbin’s reading list this Fall, as well as on those of the millions of other passionate followers of the Notre Dame Fighting Irish football team, The Gipper: George Gipp, Knute Rockne, and the Dramatic Rise of Notre Dame Football tells the story of how a small, unknown Catholic university in South Bend, Indiana, became one of this country’s most storied college football programs. Bestselling author Jack Cavanaugh (Tunney, Giants Among Us) uses his vast experience as a sportswriter for the New York Times and Sports Illustrated, to name a few, in weaving the story of how recalcitrant, enigmatic loner—George Gipp—reluctantly acquiesced to the challenge of then-Notre Dame assistant football coach Knute Rockne to come to practice after Rockne witnessed Gipp casually drop-kicking 50-yard field goals for fun. 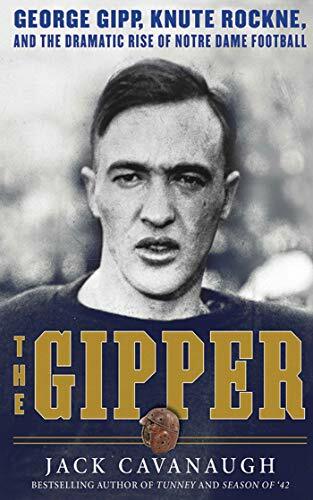 From the day Gipp hit the practice gridiron for the Notre Dame freshmen team until the day he unexpectedly died following the 1919 season, his legend grew as he became one of the greatest sporting heroes of the early 20th century. Along the way, as Cavanaugh points out, Rockne was there to stoke the flame of his shooting star, as well as help put the University of Notre Dame on the map. The beauty of Cavanaugh’s storytelling, aside from several distracting instances of redundant factoids throughout the book about players’ heights and weights, is his ability to corroborate truth from myth about Gipp and Rockne in explicit detail. Neither men were saints—Gipp was as well-known for his acumen with a pool cue and at the poker table as he was at punting, passing, kicking and running a football, and Rockne allowed his star player to come and go as he pleased including not attending classes, taking exams or practicing—but their transgressions of yesterday pale in comparison to some of the shenanigans that occur today. That said, Cavanaugh also gives readers a history lesson about the origin of college football’s laissez-faire accordance to rules when it pertains to the “student” aspect of the “student-athlete” label so widely exalted in today’s game. Throughout the 279 pages of The Gipper it is true that most of the book focuses on Gipp, his life on-and-off the field, as well as his relationship with Rockne, the man who defined the brand—Notre Dame Football. For without these two men, Notre Dame Football as we know it today would not exist. The other beauty of Cavanaugh’s story is how he creates an historical helix between Gipp and Rockne in order to show the progression of Notre Dame from small-time Midwest football team to one of the most recognizable and favored college football teams of all-time that boasts College Football Hall-of-Fame players and coaches, as well as NFL Hall-of-Famers. The Gipper is a must-read for fans of college football. For Notre Dame alumni, ardent supporters, and anyone associated with the Fighting Irish throughout its history, Cavanaugh’s page-turning story will keep you up all night unable to put it down.